A pioneer of aerial yoga teaches the practice at Stoneleigh yoga studio. I always wanted to fly through the air like Superman when I was a kid; who didn't? But you don't have to be young to harbor that fantasy. What's more, you can turn your childhood dream to reality at any age. And you don't even have to leave Towson. All you need is the gumption to lift your feet off the ground, knowing that the only things keeping you airborne are your "core"—the constellation of muscles that wrap around your middle—and a thin, stretchy piece of fabric. Recently, I gave my own Superman dream a shot. The liftoff took place at an aerial yoga class, held at an unassuming yoga studio in the Stoneleigh Shopping Center. Yoga on York opened in November 2010 after taking over a portion of neighboring business Home Goods. It's one of only a few studios in the Baltimore area to offer this relatively new form of yoga. It might seem odd that this cutting-edge brand of yoga is offered at an otherwise fairly staid shopping center, whose tenants include Stoneleigh Lanes and consignment shops. “I had no plans to open a yoga studio,” said Bernasconi, a slender and sinewy woman with a soothing voice, a halo of wavy gray hair, and a black tree with outstretched branches tattooed under the nape of her neck. But when her husband accepted a job at the University of Maryland, the couple moved to Baltimore and, as Bernasconi tells it, the opportunity to open the studio "fell into her lap." If you’ve ever been to a Cirque du Soleil show where the performance artists demonstrate amazing acrobatic feats while clinging to or swinging from fabric, you’ve got a strong sense of what aerial yoga looks like—when performed by an advanced student, that is. Aerial yoga classes are centered around the use of a long loop of fabric suspended from the ceiling with the aid of two carabiners, the sturdy metal hooks used in rock climbing. But it’s not just any piece of fabric. When no one’s twisted around in the fabric, it looks almost like a swing. But it's strong enough to support up to 1,000 pounds of weight, and lightweight enough so that an adult-size fist can grasp its entire width. When expanded, however, this flimsy looking piece of fabric stretches wide enough for an adult to lie horizontal in it comfortably. This makes for a fun twist to the savasana pose, otherwise known as the "corpse pose" and intended to induce a state of total relaxation at the end of every yoga practice. In most yoga classes, the pose involves lying on your yoga mat with your eyes closed. In aerial yoga, it's a completely different experience. With your entire body wrapped cocoon-like in the fabric, you sway ever so slightly. It feels like being in a hammock in a 10 mph breeze—there’s really nothing quite as relaxing. But you don't have to wait until the end of an aerial yoga class to feel thebenefits. As Bernasconi points out, this form of yoga minimizes compression on the spine—particularly during "inverted" poses; that is, when you're upside down. In a traditional yoga class, students perform a headstand by balancing on their heads, with support from their shoulders, arms and core muscles. The headstand is considered a fairly advanced pose because of the strength and balanced it requires. 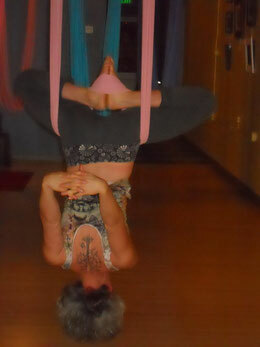 But in aerial yoga, even a beginner can do an inversion pose when properly supported with the fabric. After some hesitation, I gave the inverted headstand a shot during my inaugural aerial yoga class. Having taken traditional yoga classes for several years, I am fairly comfortable in a headstand. But knowing that your head—and entire body for that matter—is mere inches off the ground in an aerial yoga headstand is a completely different matter. With Bernasconi's encouragement, I went from sitting on the loop of fabric to pulling myself into an upside-down position, using the strength in my arms. Then I wrapped my feet around the fabric, inching my legs out to a straightened position—easier said than done when you're upside down. Then I just hung. Now I think I know why bats hang upside down all day. There's no cooler feeling. "With all that blood rushing to your head, it wakes you up," Bernasconi said.